Class struggle has returned to a region once known for militant unionism. Today it’s not the coal miners but 35,000 who teach, transport, and feed students in every K-12 public school in West Virginia. They are fighting for principles that go beyond their just demands for wages and benefits and deserve our solidarity as we absorb the lessons of their conflict. The very existence of their unions is an act of defiance. Public sector collective bargaining is outlawed in West Virginia. They may soon be hit by strike-breaking injunctions—nothing new in coal country. What would be unprecedented is unlikely compliance with such orders. The leaders of the two teacher unions reached a tentative agreement with the Governor on the fourth school day of the strike. It included a bump from an initial offer of a one percent raise to five, a one year freeze on health insurance premiums, and a “task force” to study the state’s collapsed public employee insurance system. The bureaucrats declared a “victory” and directed the school employees to return to work. But the TA amounted to no more than a handshake. There was no guarantee the Democrat turned Republican Governor could sell it to the GOP majority in the legislature. Voting in the state Senate in fact proved chaotic. In any case, while the workers whose last raise was four years ago welcomed the promised 5 percent boost they considered the out of control health care costs to be even more important. They wanted action, not another study. The teachers overwhelmingly rejected the tentative agreement–and continued an “illegal” strike–to try to get some permanent relief from soaring out-of-pocket health care costs. Nearly all other major countries have legislated health care covering everybody. In Britain all medical, dental, optical services and devises, along with prescription drugs and mental care are free to users through the National Health Service. A central demand of the now defunct Labor Party was Just Health Care, a much improved version of Canadian style single-payer, closer to Britain’s socialized medicine. A watered down single-payer bill first introduced in Congress in 2003 by now “retired” John Conyers, rechristened last year as Medicare for All by Senator Bernie Sanders, continues to haunt the Capitol like a harmless ghost. State versions have been attempted without success in California and other “blue” states. These are promoted by groups like Physicians for a National Health Program, Health Care Now, Labor for Single-Payer and more recently the rapidly growing Democratic Socialists of America—all honest committed folks, some once part of the Labor Party. After years of hard work they finally won the endorsement of last year’s AFL-CIO convention. Their current strategy is to inject Medicare for All in to the Democrat “resistance” going in to the November midterm primaries and elections. But they are finding resistance by many of labor’s “friends” to single-payer. Of course, they are only talking about one of two “large parties.” That would be the perfidious one that has a great track record of co-opting progressive mass movements to place them in hospice until they are ready for the graveyard. Bernie Sanders’ popular 2016 “Political Revolution” primary campaign was the umpteenth such effort. At the end of the day the “revolutionaries” got on board the neoliberal Hillary Clinton bandwagon–that managed to lose an election where she received the most votes. I didn’t sign up for that “revolution” and I’m sure as hell not supporting its 2018 redux. In the tradition of Eugene V Debs and Tony Mazzocchi, I remain a Labor Party Advocate. * Since 1911, International Women’s Day. This annual event was institutionalized as the result of a resolution by the 1910 Women’s Conference of the Socialist International. The idea was inspired by actions of the American Women’s Trade Union League who first used the March event in 1908 to promote organization of garment workers, as well as demanding the right to vote. IWD was also briefly embraced by the new feminist movement that developed in the late Sixties. Last year saw the most and biggest IWD actions in decades. * In 1917, the IWD demonstration in Petrograd (later Leningrad, now St Petersburg), triggered a revolution that toppled the last Russian Czar and led to the establishment of the soviets. * In 2000, the KC Labor web site was launched. I, of course, don’t claim the third is in the same league as the first two. But there are relatively few websites that have been in continuous operation for eighteen years. In 2000, dial-up was still common, Netscape was the browser of choice, Wikipedia had not yet been launched, and Google was just getting started. From the start, I received valuable help from Doug Bonney, a labor and civil liberties lawyer who contributed a number of Know Your Rights articles. My wife Mary Erio, a Certified Industrial Hygienist as well as an environmental engineer, set up a Labor Safety page. We blended a lot of original content with topical directories of useful links. In various formats we have always provided links to news stories of interest to working people, currently through our companion Labor Advocate blog. Since 2004, the Week In Review has been a regular feature. Along the way we’ve hosted several educational conferences and donated web pages to local Labor Party and US Labor Against the War chapters. With no formal training, the technical side has for me been trial and a lot of error. Since Microsoft stopped supporting their proprietary Front Page software used to build the site it’s been a challenge to keep everything updated. Open source WordPress has enabled me to continue the WIR. On our first day online we recorded eight visits—all through personal invitations. Today we average about 220,000 visits a year. We expected mostly local traffic from the Kansas City area. But results have been just the opposite. Nearly a quarter of our visits come from outside the USA and we have verified they originate from at least 84 countries. Tradition recommends Porcelain as a gift for eighteenth anniversaries. I already have a tea set and I own nothing to put in a jewel box. But since I have no paywall around content, do not seek grants, and don’t accept commercial advertising, a gift of 18 U.S. dollars through our donate page would be a nice way to help us—Medicare willing–make it to number nineteen. 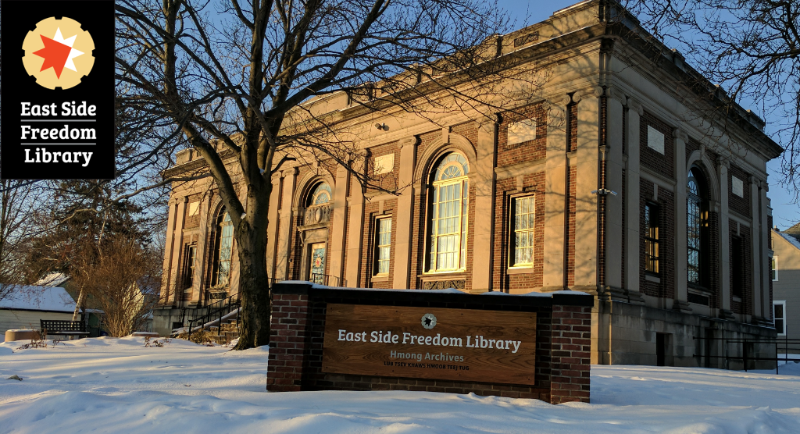 I will pass along other items but, of course, a good place to start is the always ambitious schedule of monthly events at St Paul’s East Side Freedom Library.